Owner David Sparrow is a native North Carolinian who came to Ithaca, New York, in 1977 to pursue graduate studies at Cornell University. He has been a wine enthusiast and collector since living in Italy in 1975. Before opening his own shop he had worked in another retail setting as well as in the wholesale sector of the wine industry in Upstate New York. 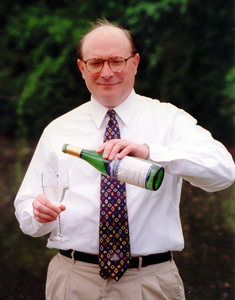 David opened Sparrow’s Fine Wines in February 1997 on North Meadow Street, and moved to the current location at the corner of Fulton Street (Route 13 South) and West Green Street (see map) in February 2001. Others you’ll see in the shop include Josh Carlsen, who is a full-time retail assistant, and David’s wife, Rebecca. David is constantly seeking interesting products to offer at attractive prices. Our goal is to help customers find a wine that meets the need—at a price that fits the budget. We always enjoy helping customers select cases of wine, offered at 15% discount (solid or mixed cases).